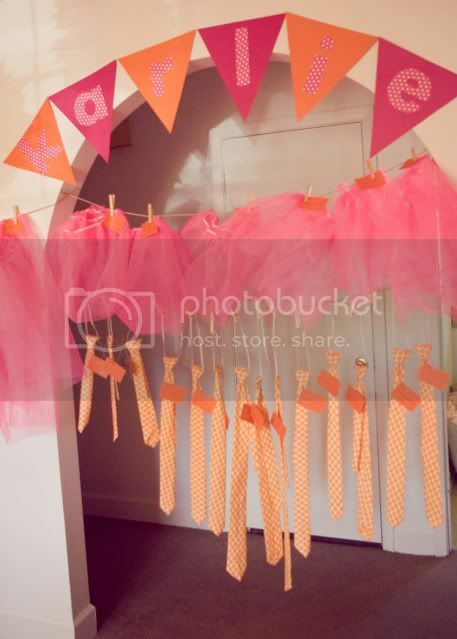 Kara's Party Ideas | Kids Birthday Party Themes: Tutus and Ties Birthday Party! 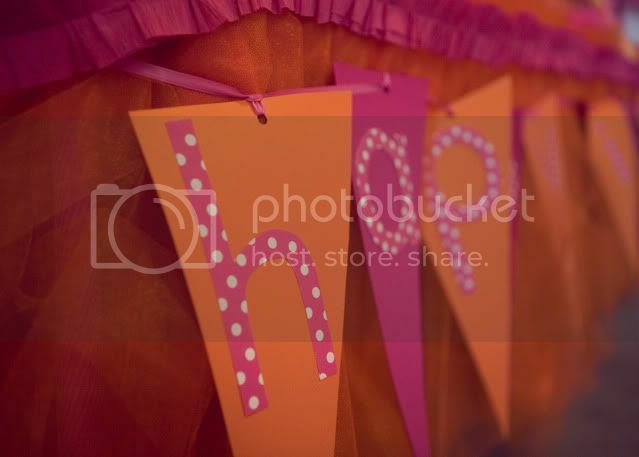 Kara's Party Ideas | Kids Birthday Party Themes: Tutus and Ties Birthday Party! Tutus and Ties Birthday Party! What a fun and original theme! 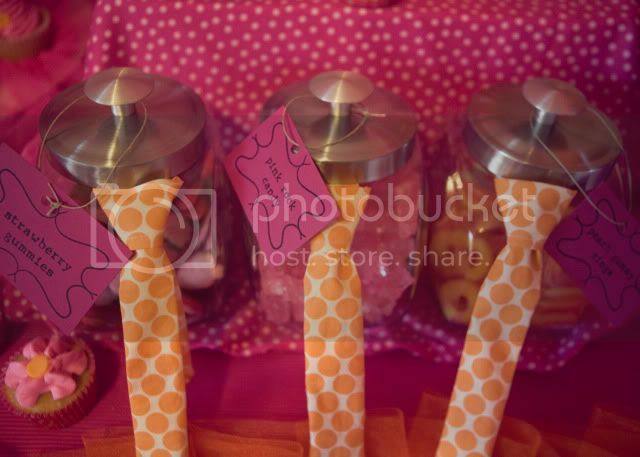 I love the spectacular twist Kerri added to a girly tutu party....Ties! I'm always a sucker for orange and pink, too. 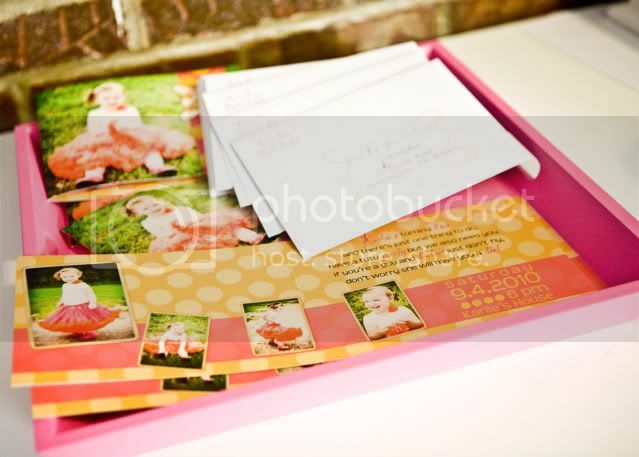 Thanks for sending in your party, Kerri! Congratulations on being featured today! You did a wonderful job. I love this party! 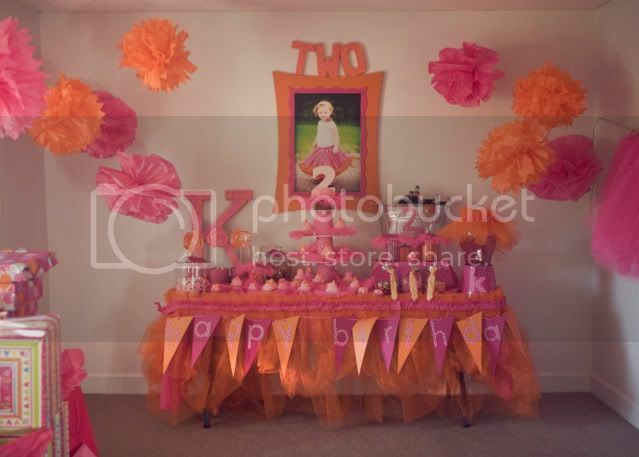 How did you make the tutu table cover and tutus for the table decorations? Love it Love it Love it!! Me too! 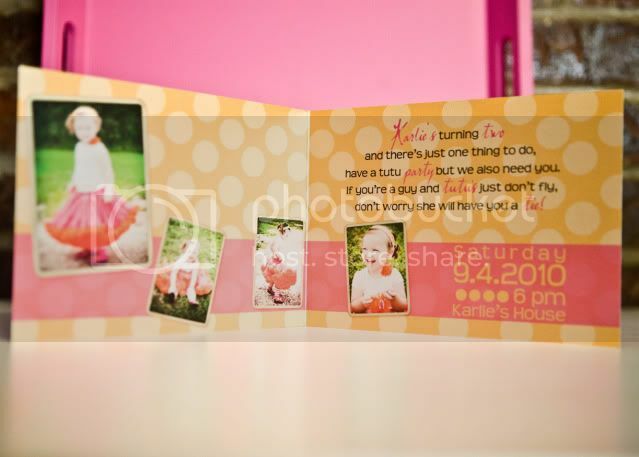 I love the birthday trend that has something for both boys and girls! The tutu bunting on the table is too adorable! Thanks for sharing! Ditto what the others said! Lots of love in this party! Would love to see a tutorial on the cupcake stand. i love everything they did! I love pink and orange together and that dessert table is really a show-stopper!! Oh my GOSH! Thanks for sharing this spectacular party decor with us. 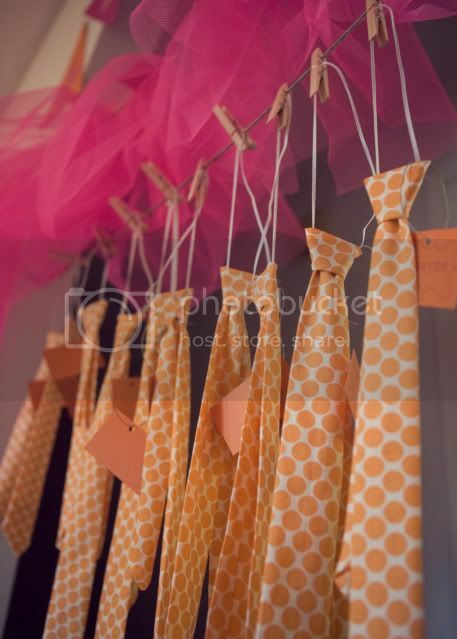 Gorgeous with a capital G. I will earmark this little idea in my brain... Orange & pink, ties for the guys! Beautiful, creative, talented job! Congrats on the win! Absolutely precious!! Where were the invites ordered from? Love the colors and the table is GREAT! Please, please, please tell us where you had the invitation's done!! adorable! I love the pink and orange too! I love all the details. The cute picture frame above the table is super cute, would love to know the details on how that was made. 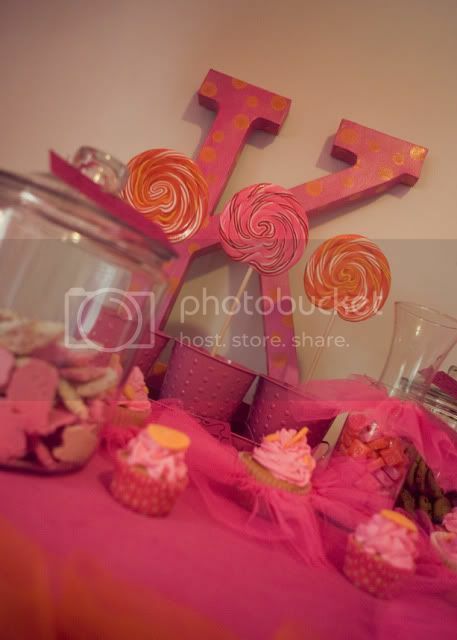 I also love the "tutu" around the table and the Giant "K" is a nice touch. I also like the idea it was done with both boys and girls! just perfect! 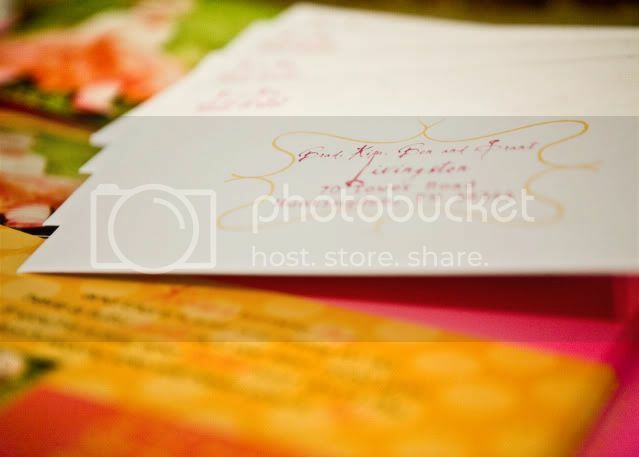 *I am a photographer turned graphic designer so the invitations I designed myself. I have a design blog+site that should be up and running in a month or so and I would be more than happy to design invites. the address will be www.eclecticdoodle.com. 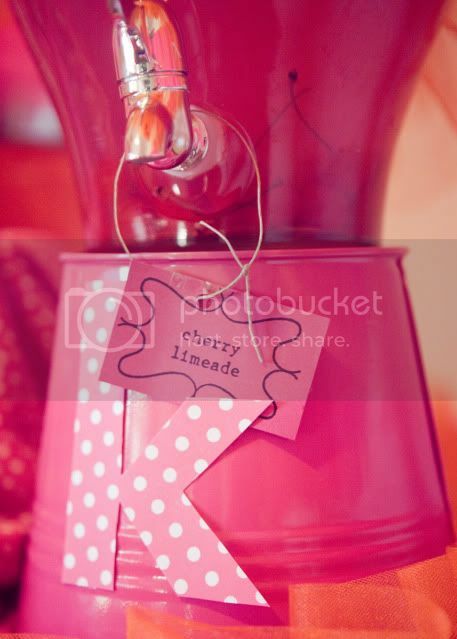 * the table skirt is made from tulle that i sewed together then pinned to the hot pink fabric i had on the top of the table. to cover where the pins were i ran hot pink crate paper that was sewed together. I LOVE this party. The pink and orange is so gorgeous together. I love that it's a new modern alternative to the princess and pirate party. Yo are right, how unique! And, such a great idea to make the boys feel special too. Love everything about this party! 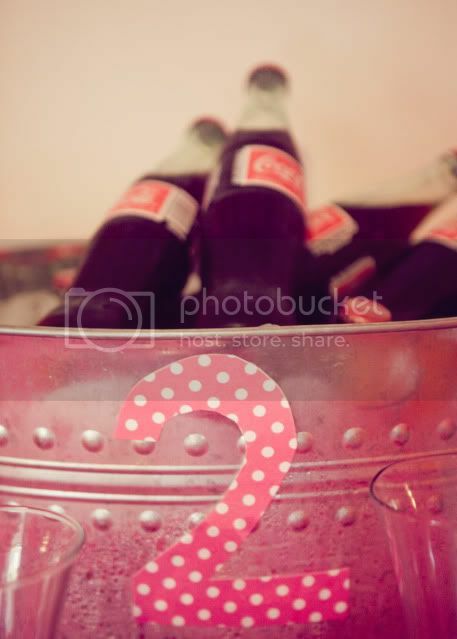 I have been looking for a cute idea for my daughters second birthday coming in December. I just found it! This is adorable, thanks so much for sharing! Where did you get your ties, or did you make them? This is gorgeous! 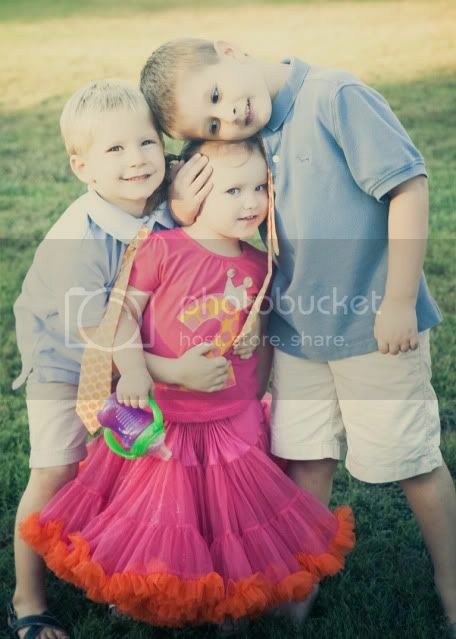 I would also like to know where you got the ties...they are too cute! My 38th is tomorrow and I'd love for it to look like that! Beautiful - can you tell me about the tutu's around the cupcakes? Did you make these? If so, how? Or where did you purchase from? Thanks for sharing! Love to know where you got the peddi from and which tie tutorial on etsy. Are those tutus hanging above the ties too? Did you make those or buy them? Thanks! Where did you find this tutu. I like the fullness of it. I am doing a TuTu party next month for my daughter and feel in love with all of your ideas! 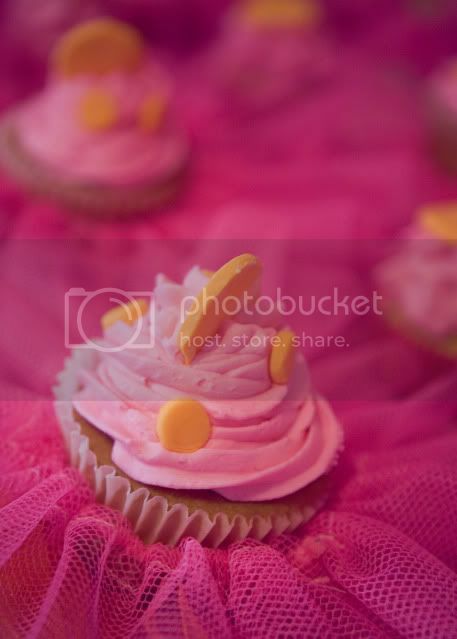 I am just wondering how you did the tutu's around the cupcakes and more detail on how you did the table cloth? Was there alot of sewing involved? Ok, one word - amazing! 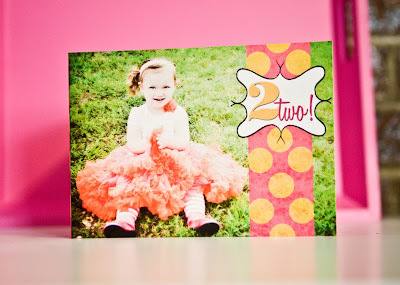 I am fully using this as inspiration for my daughter's 2nd birthday in March! Do you have a link to the tie pattern etsy page? There are so many and I would love which ever one is tried and tested to be easy! I am going to start this month so it is done! So fun! Hi guys! I just realized how many questions/comments I missed on the party. Sorry! *I used "Little Lads" necktie pattern from etsy. 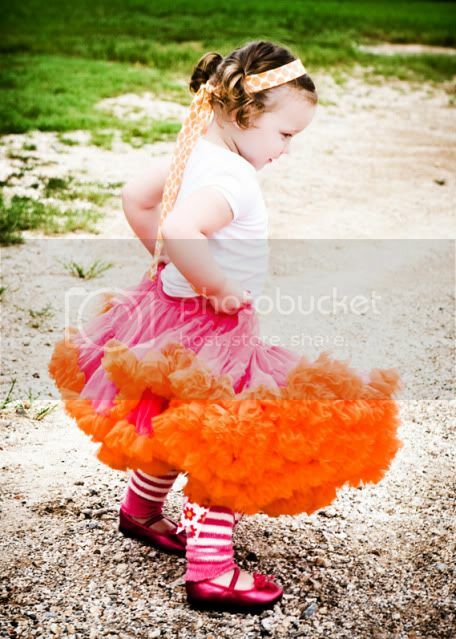 *I bought the pettiskirt from oopsydaisybaby.com they have a great selection of colors! I cut strips of 6" out of my tulle. Then I sewed a casing at the top. Then I fed a pink pipe cleaner thru the casing and then twisted the ends together. It gave just enough fullness.